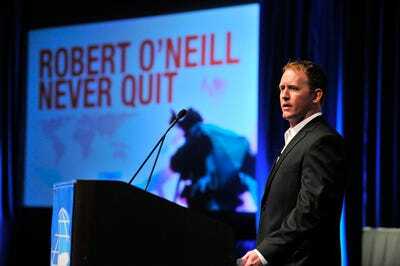 Robert O’Neill/RobertJOneill.comFormer Navy SEAL Robert O’Neill. Robert O’Neill, the former Navy SEAL who says he shot Osama Bin Laden, has an answer for his critics. In the second half of his exclusive interview with Fox News, which was broadcast Wednesday, O’Neill discussed the possibility people might question his story. Since the Fox News special was filmed, sources with knowledge of the 2011 raid on Bin Laden’s compound in Pakistan have reportedly questioned O’Neill’s claim he fired the fatal shot at the Al Qaeda leader. O’Neill told Fox News he was aware people might be sceptical of his story and pre-emptively offered a rebuttal. He told Fox News he confronted Bin Laden directly and shot him three times. O’Neill’s story is slightly different from the one presented in a 2012 book about the raid by another former SEAL, Matt Bissonette. In his book, Bissonette wrote that he was the number two person in line as the U.S. soldiers entered the room where Bin Laden was. Bissonette also said he fired shots at Bin Laden when the Al Qaeda leader was on the ground. However, O’Neill said he was the second SEAL into the room after another one of his colleagues cleared people out of the way. He also said he killed Bin Laden after shooting him in the head multiple times. O’Neill addressed the discrepancy between his story and Bissonette’s book in his interview with Fox News. “I think that war is foggy and I think that the author is telling the story as he saw it and also based on the debrief the he heard,” said O’Neill. “The debrief was just cleaned up, it was missing a few details,” he explained. O’Neill also insisted the bullets from his gun unquestionably killed Bin Laden whether or not other SEALs fired their own shots before or after he hit the Al Qaeda leader. Currently, both Bissonette and O’Neill face scorn from their Navy SEAL counterparts for not only violating non-disclosure agreements but for pursuing public attention on the backs of what was a team effort. “I don’t feel like the Navy owes me anything. I don’t feel like I owe the Navy anything. My only regret is that, I miss my guys,” O’Neill said. After the Bin Laden raid, O’Neill went on his 12th and final deployment with the Navy SEALs and decided he wanted “a clean break” from the military community. O’Neill has been touring the nation as a motivational speaker.